Round 5 of the Remote Housing Systems 2010 Motorkhana Series was hosted by the North Australian Motor Sports Club at Hidden Valley Raceway on Sunday 16th May. 23 cars and enthusiastic drivers attended in windy conditions to master the challenging driving courses. Series leader Tim Feehan had a below average result finishing 6th for the day, but doing enough to retain the overall Series lead after the five completed Rounds. Title challenger Darren Ford shared brother Bens Toyota Supra to finish best of the siblings in third place on the day ahead of Ben in ninth and Jarrod in eleventh. Showing that Motorkhanas are accessible to anyone, the boys mother, Colleen, finished a creditable 16th in her second ever event driving a Honda Jazz. First time competitor Brad Retzki in a S13 Nissan performed above expectations to finish second behind Round winner Norman Millington driving a Cooper S Works Mini. 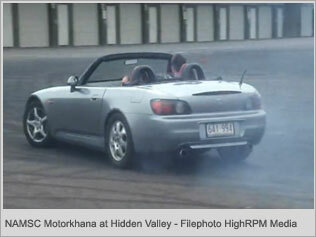 HighRPM and NAMSC MOTORKHANA Hidden Valley May 16 2010 by Ed Forman RX2re from rx2re on Vimeo.